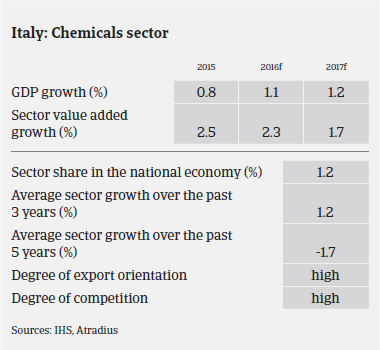 In 2015 Italian chemicals/pharmaceuticals production increased 1.3%, to EUR 82 billion. Exports increased 4.2% in volume and 3.9% in value, driven by increased demand from the US (up 15%), China (up 13%) and India (up 20%), while exports to Russia and Turkey decreased. In Europe, exports to Germany and Spain decreased 2%, while deliveries to the UK (up 6%) and the Netherlands (up 20%) increased. Finally, domestic demand started to contribute positively in 2015 (up 2.5% in volume). However, demand from Italian buyers still remains uneven: while demand from the automotive sector and consumer goods grew, demand from the textile and construction sectors is still weak. Along subsectors, fine and specialty chemicals businesses (paints, inks and adhesives, detergents and cosmetics) are performing well due to a high export share, lower impact of raw material prices and energy costs compared to the basic chemicals segment, and good margin ratios. That said, the refining segment suffered from overcapacity in the past few years: in 2014 only 68% of the capacity was used, causing the closing and conversion of five plants. However decreasing oil prices since H2 of 2014 has helped to boost demand, and the refining segment benefitted from an increase in the plant usage, but margins in this segment have remained under pressure in 2016. In 2016 chemicals production growth of 1.4% is expected. Export growth will continue, helped by a lower euro exchange rate, but at a slower pace than in 2015 (up 3%), accompanied by further rising domestic demand (up 1.5%). Expected improvements in domestic demand will gradually reduce the difference between strongly export-oriented businesses and companies highly dependent on the domestic market. Nevertheless, the rebound in domestic demand is expected to remain slow, as customers’ purchasing behaviour remains cautious because of liquidity constraints, a deflationary environment and oil price uncertainty. The margins of many chemicals/pharmaceuticals businesses remain affected by high energy and labour costs, despite lower oil prices. 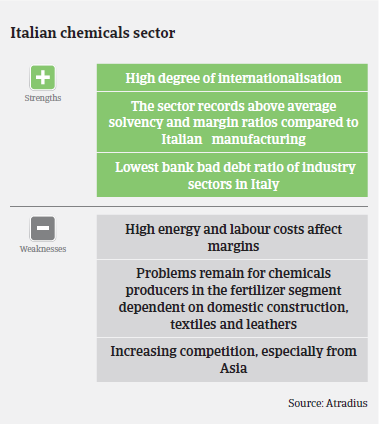 Italian specialty chemicals producers have not benefitted from the significant commodity price decrease. Competition in the low value added chemicals segment is high due to overcapacities and modest domestic demand, which is still below the pre-crisis level. Competition in the high value added segment is lower due to high entry barriers. The gearing of businesses in this industry is rather low, as they usually have above average solvency ratios and good margins, in general higher than the average for Italian manufacturers, allowing regular debt repayment. On average, payments in the Italian chemicals sector take around 60 days. Payment experience is good, and the level of protracted payments has been low over the past couple of years. Payments generally occur on time. Non-payment notifications are low, and even decreased further over the last six months. The number of non-payment cases is expected to remain at a low level in H2 of 2016. The level of chemicals/pharmaceuticals insolvencies is low, and this is expected to remain unchanged in H2 of 2016, sustained by further economic growth in Italy. 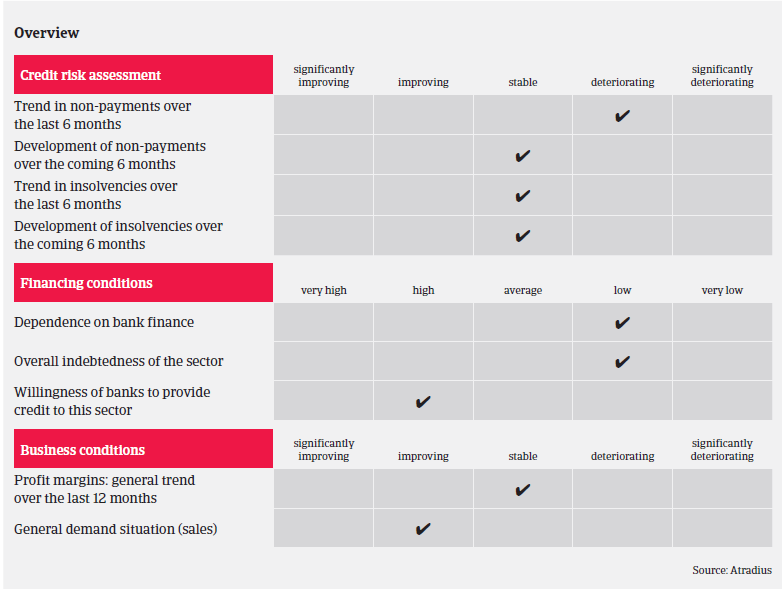 Considering the positive outlook for the industry, the low level of bank bad debts and the above-average solvency, our underwriting approach to the Italian chemicals sector remains relaxed. However, subsectors and businesses dependent on construction, construction materials, consumer durables, and furniture still require particular attention, as the expected rebound of the Italian economy is still modest. A more cautious approach is also applied to the refining segment, as performance is strictly linked to price dynamics, and margins of businesses have recently decreased.